Aside from delicious sandwiches, these grills can create delicious steaks, juicy chicken pieces, tender sausages and a variety of other foods – all in the comfort of your own kitchen. Our top choice has to be the T-fal OptiGrill Electric Grill. We feel this unit offers the most versatility out of all our reviewed models. The manufacturers have clearly put effort into understanding what their customers want and this grill really delivers. Along with the grilling capabilities, the removable plates on this model are a breeze to clean. All in all, if you’re looking for a Panini maker that is low maintenance but high tech, this will be right up your alley. The T-fal GC702 OptiGrill Indoor Electric Grill is on the smaller side but offers plenty of convenience. This model is packed full of technology to take the guesswork out of cooking and produce perfect food, no matter what you are cooking. The smartest feature is the grill’s ability to detect the thickness of the food inside and then automatically adjust the temperature to suit. All you need to do is use the input buttons to tell it what kind of food you are cooking – burger, sandwich, sausage, red meat, fish or poultry – and it will do the rest. There are some pretty nifty indicators for you to monitor progress. Firstly, there are loud beeps during cooking, which indicate rare, medium and well done. The small light panel also changes color, from blue and purple during warm up, through yellow, orange and red for the three phases. It also has a frozen mode – which may not work as well as your trusty microwave but does a good enough job – and manual mode for when you want to take the reins. The nonstick plates can be removed for easy cleaning, and they are dishwasher safe, as is the drip tray. When in place, the plates are angled so that fat and juices drip down into the drip tray. You will need to have a thorough read of the instructions to get your head around all the different functions, but once you have it figured out, you should be pleasantly surprised at how well those presets really do work. Unfortunately, with such awesome technology, there’s bound to be a few flaws. This T-fal OptiGrill can be very touchy; it’s far too common and easy to inadvertently cause a malfunction which sends it into manual mode. If this happens, you need to contact the manufacturer and perform a recalibration; however, it may continue to happen enough to become an annoyance. Another downer is that if you want to open the lid to check your food during cooking, it may confuse the machine and send it into manual mode. Overall, this is a great machine which does cook food to perfection without any major effort on your part. It’s intuitive and helpful and a great addition to any kitchen. Just be aware that there may be some operational hiccups along the way that you’ll need to work through. The Breville BGR200XL Variable Temperature Panini Grill is loaded with adjustable options, including a manual temperature control and a lid with height adjustment capabilities. If you’re looking to just lightly toast your sandwich or wrap, you can finish it with a little heat without smashing it. As opposed to the T-Fal model above, the plates in the Breville are not removable, so may be a little bit trickier to clean. When it comes to removable cooking plates, there are two camps. One side maintains that fixed plates more commonly have the heating elements directly inside, therefore creating a more powerful and even cooking surface. The Breville definitely provides a smooth, even cooking surface on both top and bottom. The other side argues that the slight sacrifice in improvement in cooking ability is totally worth the ease of cleaning offered by removable plates. It’s a personal choice, which depends on how patient you are when it comes to those niggly kitchen tasks. Aside from cleaning considerations, this Breville has some great features. It has variable temperature settings, including a sear option which does a great job. The size is generous and the higher sides of the grill limit splatter. Like most models, it’s slanted so fat and grease can drip away into a large and easy to clean drip pan – the feet can be adjusted to change the drip angle or provide a level cooking surface. We love that this model can be stored standing on its edge, so is easy to tuck away when not in use. Unfortunately, there are often problems with the on/off power switch at the rear of this model. It is known to be faulty quite often, failing to properly turn off, which can be a hazard in your kitchen. Also, if you’re looking for something that can also make great pancakes and eggs on top of perfect paninis, this is not the right model for you. The Breville Grill fetches quite a high price. It does, however, do a great job of cooking, with plenty of options for manual control and an adjustable lid to fit even the most packed Panini. 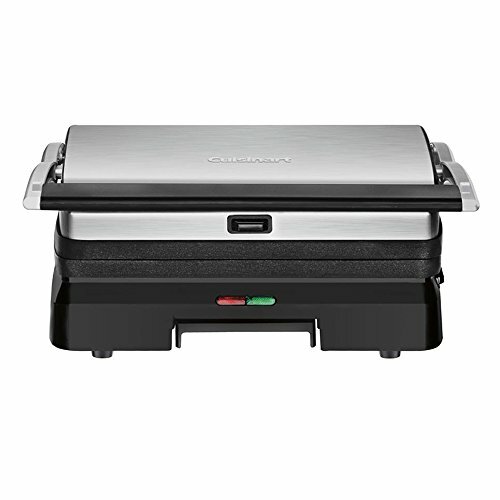 The Cuisinart GR-11 Griddler Panini and Sandwich Press displays typical Cuisinart simplicity and safety. This is a smaller grill than many; only 14 by 12. The handle offers great extension and some elevation, so when you press down you’re not steaming your knuckles. This is one of the few models that can fully open flat to provide double the cooking surface, so it’s ideal for those wanting a bit more space. However, it’s also one of the few units that has only one preset temperature, so gives you very little control over your cooking. Having said that, the preset temperature does seem to work well for most foods. The front feet can be adjusted to give better drainage, and floating hinges adjust to different food thicknesses. It does seem to struggle with especially thick sandwiches, forcing them to fall forward and slide apart. Additionally, the cord is a bit short so you may struggle to find a permanent countertop spot for this appliance. The Cuisinart GR-11 has dishwasher-safe plates which are easy to remove – a bonus for those who don’t have the patience for fiddly cleaning – however, the drip tray is built in. This is a good model for smaller kitchens, it takes up about the same amount of counter space as a large toaster, unless fully opened. A great choice for a dorm room, small home, and any chef who wants a straight-forward grill with no extra bells and whistles. The All-Clad E7959664 HAA1 Hard Anodized Nonstick Panini Pan with Press is designed to grill on your stove top rather than being a separate unit. Unfortunately, it won’t work on an induction oven. It is a real workhorse, coming in at 8 pounds of non-stick cooking power and many users note that the lid is heavier than the pan. The base panini pan is 10-inches, and the weighted press is designed to quickly and evenly cook your mouthwatering paninis and sandwiches. Both pieces should be pre-heated on the stovetop before cooking. If you’re planning to heat the lid and use it to grill from the top, be sure to add some fat to the top surface of your food so the lid doesn’t stick and ruin your sandwich or wrap. Both parts are dishwasher safe, but All-Clad still recommends handwashing. There are benefits and disadvantages to this kind of panini press. You have control over the temperature by using your stovetop; you don’t have to worry about power outlets; clean-up is easy and you can simply use the base as a grill if you don’t want to press. The downside is that it’s a lot more hands-on than many of the plug-in options, with no beeps, lights or automatic controls to help take over your cooking process. However, some people may prefer this method. Temperature conduction is fantastic with this All-Clad Panini Pan. It’s a more affordable option than many of the electric models and is portable, so can be used almost anywhere. 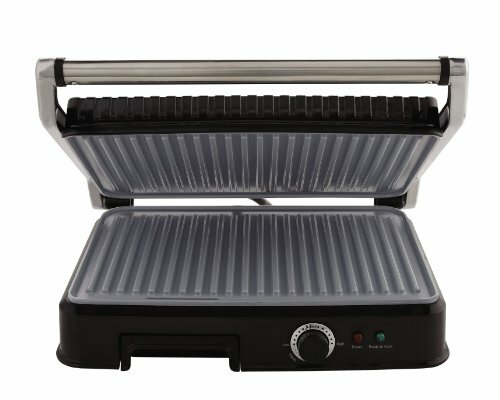 The Oster ECO Extra Large DuraCeramic Panini Maker and Indoor Grill is built to cook for a large household; it is capable of grilling three good-sized sandwiches at once. The temperature control dial is right at the front and there’s also a set of go/no-go red and green buttons so you’ll know the exact moment to place your sandwiches or burgers on the plates. Unfortunately, grease doesn’t drip from this tool but simply drops into the slots and stays hot, sometimes causing smoke. The ceramic nonstick plates are not removable, so cleanup can be a challenge. There is no on/off switch – which shouldn’t really be a drama, simply switch it on or off at the wall, it also lacks a timer, which really shouldn’t be a deal breaker anyway. The feet are adjustable for different angles and the hinge system is floating to adjust to different thicknesses. Temperature is also adjustable, giving you quite a good degree of control over the cooking process. The trays are not removable and the drip catcher is built in. Although the plates are supposed to be non-stick, you may still be frustrated when it comes to clean up – these models can potentially be a nightmare to clean. The Oster Extra Large Panini Maker is perfect for a large family. The price is good, the temperature is adjustable, and if you can get past the annoying clean-up, you’ll have plenty of delicious paninis, steaks, and burgers to eat with the extra space it provides. 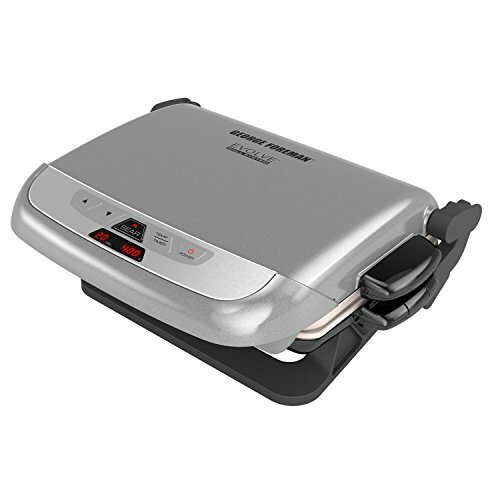 The George Foreman Multi-Plate Evolve Grill can be purchased just for sandwiches and burgers, or you can invest in attachments and make waffles as well with this versatile tool. This grill offers just over 1400 watts of power. We love the 500F searing burst, which blasts your steak for 90 seconds before settling back to finish it off nicely on grill. There’s an easy to read digital panel which shows you the cooking time and grilling temperature – temperature and timer are both adjustable. The plates are made of ceramic, rather than coated with non-stick coatings. They are removable for easy cleaning and totally dishwasher safe. As with all models, you can adjust the tilt for grease to run off, but you can also lay it flat for sandwiches. The floating hinge is meant to accommodate different thicknesses, but with thicker sandwiches, the lid tends to push food forward when it’s closed – not ideal. Unlike the majority of reviewed grills here, this one isn’t so intuitive – you may need to spend some time experimenting to find the right temperature and time settings. 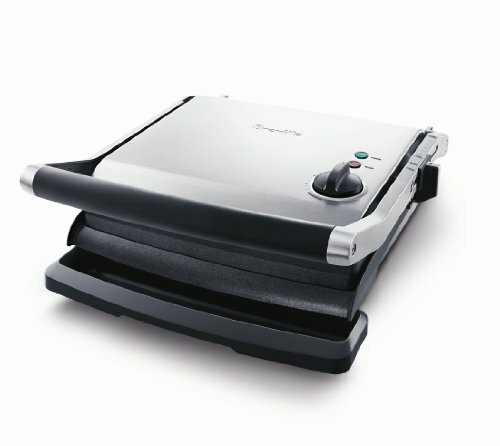 Ceramic plates are good to start with, but with this George Foreman Evolve Grill you might be bitterly disappointed at how quickly they go from being “non-stick” to “stick.” That means you’ll need to start using a little extra oil. Many users swear by their George Foreman Grills. This is a decent model which should see you through most cooking jobs once you figure out your ideal times and temperatures. If you’ve got the space, an electric Panini press is a handy tool that often offers removable non-stick grill plates that can go directly from lunch preparation to the dishwasher. For those with limited storage, consider this stovetop Panini pan. These shallow frying pans feature a non-stick bottom and durable handle for maneuvering the weight of the top of the Panini press. 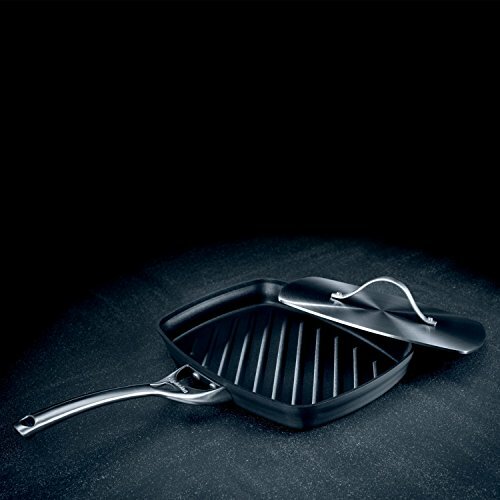 The Calphalon Contemporary Hard-Anodized Panini Pan and Press is an aluminum stovetop Panini pan with diagonal grill marks on the bottom. This pan is 1.5 inches deep so you can use it to cook meats and other dishes. The flat lid will hold the heat, cook from the top and prevent spattering. The lid for this pan has a tall handle but the curve of the handle is quite extreme. Again, these pans and their press lids are quite heavy. If your hands can’t tolerate a lot of weight, this handle may be uncomfortable to use regularly. This model is dishwasher safe and oven safe, so versatile enough to go from counter to stove to oven for different cooking tasks, then easy clean up! The handles are designed to be extra long so they stay cool on the stovetop, which they most definitely do. The ridged base effectively drains fat and adds those attractive grill marks to your food. Panini pans can turn a simple sandwich into a lovely presentation. Invest in the tool that works best with your storage needs and physical capabilities, and don’t be afraid to experiment a bit. 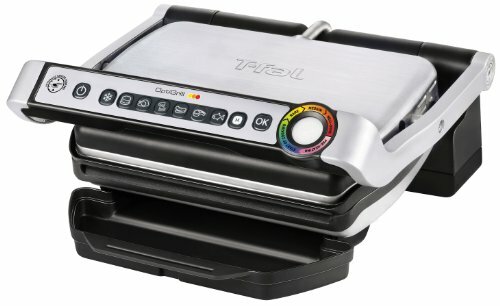 If we had to choose just one Panini press, we would pick the T-fal Optigrill. Its sensor cook programs are next level and remove the guesswork from the process; it’s a high-quality kitchen appliance with endless applications in your kitchen that will get a lot of use.